Reading standard: Students read and view imaginative, informative and persuasive texts that explore ideas and information relate to challenging topics, themes and issues. They explore the ideas, themes and issues explored in these texts, and provide supporting evidence to justify their interpretations. Speaking and listening standard: Students identify main issues in a topic and provide supporting detail and evidence of opinions. Write a 50-word summary of the video clip starting with, ‘This video clip is about’.... Include the message of the video clip and an explanation of ‘Good hands’. Is Joan Winch a ‘hero’? Decide what a hero is, and then see if she fits your criteria for the characteristics of a hero. 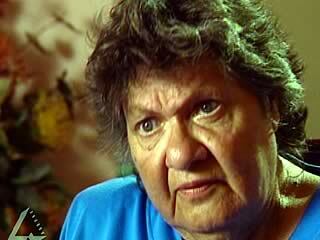 List the reasons Joan Winch gives to explain why Aboriginal people may be afraid of non-indigenous health services. Write a brief explanation of the term, ‘traditional bush medicine’. What is Joan Winch trying to do? How important is the need for health services in remote Aboriginal communities?